Looking for roofers? Look no further! When you are in need of a roofer, it can be a little nerve-wracking to find the right one! Not only is finding a roofer who comes highly recommended a tricky task, but you also want to make sure you find a quality roofer, since your roof is a long-term investment. Here in Midhurst, Ontario, you have several roofers you can choose from for your commercial or residential projects. Our team here at Slippery Slope Roofing would love to show you why we should be given the opportunity to be your roofers. 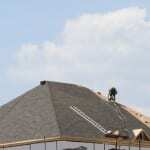 First, we have a tried-and-true work ethic that you don’t see with every roofer out there. Instead of splitting our focus by working on several jobs at once, we prefer to complete each job individually. All of our focus is on your project, enabling us to work effectively, efficiently, and without distraction. Second, we have experience that can’t be beat! With over 50 years of combined experience as roofers, our team members can work with all sorts of slopes, grades, and types of shingles for your residential or commercial roofing needs. We use our experience to make our process efficient, clean, and of the highest quality. Third, we strive to use the best materials for a long-lasting and quality roofing job. We also take care to install your roofing materials in such a way that your roof is eligible for all the manufacturer warranties. At Slippery Slope Roofing, we would love the chance to be your roofers! Contact us today for a free quote. At Slippery Slope Roofing, our roofers proudly serve Alliston, Barrie, Orillia, Bradford, Newmarket, Midhurst, Cookstown, Beeton, Innisfil, Angus, Collingwood, Wasaga Beach, Oro-Medonte, Midland, New Tecumseth, Clearview, Bradford, Essa, Stayner, Springwater, and surrounding areas of Ontario.